Nothing says summer like a fresh little button of goats’ milk cheese, rife with tart and tangy acidity. Mettowee is one of Consider Bardwell Farm’s signature cheeses, and takes its name from the lush river valley where the farm is located. The smooth and silky paste is the perfect thing to dollop atop a green salad, or to smear on toast with olive oil and herbs or your favorite fruit or preserves. If you’re really feeling saucy, have a bit of Mettowee with strawberries and champagne… you won’t be dissappointed! A sweet and creamy blue that calls to mind the famous French Fourme d’Ambert. The interior of the cheese is absolutely riddled with deep green and blue fissures that taste of white pepper, wet straw, and vanilla. The finish is long and quite spicy, leaving a zinger of a blue streak on your palate. We could eat a stack of these Tommes quicker than we could scarf a box of Girl Scout cookies! Such is the mysterious power of this tiny, but tasty cheese. A small, dry disc of rather terse and rigid curd with an unexpected kick of salty, sweaty, citrus fruit flavor. Cheese maker Barbara Brooks learned to make this cheese while traveling in Provence, where these little tommes proliferate. Go on, grab a whole handful, who said you can’t eat goat cheese like cookies? So, I goofed a bit with my post about this Friday’s party at the Yard… I wrote that the party ends at 8:00 pm which is a positively false statement. The live music will be ending around then, but the party will still be going strong! Kelly Geary, chef extraordinaire and sometime dj will be inviting friends in to keep the tunes cranking and might even step in for a stint herself. We’ll basically be up eating mac and cheese till the cows come home. So don’t worry if you can’t make it early. There’ll be plenty of music for all! Being a cheesemonger, I wouldn’t know from experience, but a little bird once told me that come June many folks are given the magnanimous gift of summer hours, thereby kick-starting the weekend and getting everyone out into the Friday afternoon sun. Well, supposing this is true, Saxelby Cheesemongers has a really good excuse for you to get out of the office early this Friday… a Brooklyn backyard cookout, complete with live music, homemade mac and cheese, apple pie, and tasty beverages culled from the borough’s best. Even if you don’t have summer hours, you should probably find a way to play hooky! It’ll be worth it… we promise. F/G train to Carroll St. or N/R to Union St.
Come one, come all to a dinner party like you’ve never seen before! We’ll be cooking up a storm and dancing our shoes off at the Yard, Brooklyn’s only backyard barbeque set on the shores of the Gowanus Canal. The Yard has invited Saxelby Cheesemongers and Kelly Geary of Sweet Deliverance NYC to bake up a serious batch of mac and cheese and serve it up alongside sautéed early summer greens and some of Brooklyn’s most delectable beverages, including Apollo wheat beer from Sixpoints Craft Ales and bourbon from the borough’s resident expert, LeNell Smothers. And the good eating doesn’t stop there… there’s gooey apple pie garnished with a hearty slice of cheddar for dessert. It don’t get much cheesier than that. While everybody’s busy filling their bellies, we’ll work on filling your ears up too, rolling out the red carpet (not to mention the dance floor) for the Woes, a band whose sound hopscotches around bluegrass, old-time, and New Orleans jazz. If you haven’t heard them, to say that you are in for a treat would be an understatement. And if you have, well, you know to bring your dancing shoes. Here’s to a fun and raucous summer’s eve… hope to see you at the Yard! In other news, tomorrow evening The New School will host a panel discussion about the state of food literacy. Panelists will be Anne Saxelby, chef Michael Anthony of the Gramercy Tavern, and Brian Halweil of Edible Manhattan. Drop by for some cheese and some chatter! And last but not least! 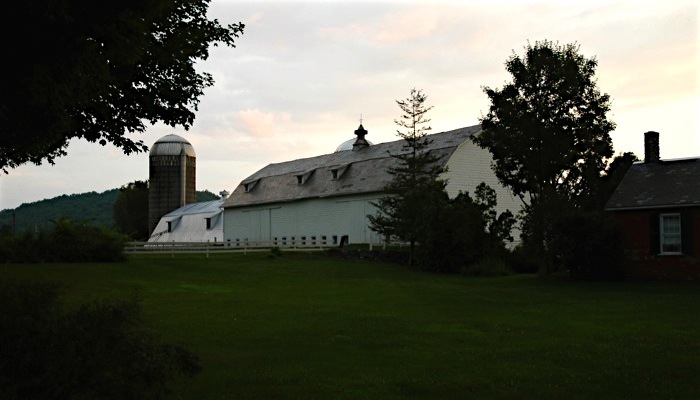 There are only 2 spots left on our Day A-Whey Weekend Trip to Consider Bardwell Farm. For anyone who’s been on the fence, now’s the time! For more information or to reserve your spot, call 212-228-8204.